BADUNG - Indonesia's promise to the international community to be actively involved in climate change shows tangible results. 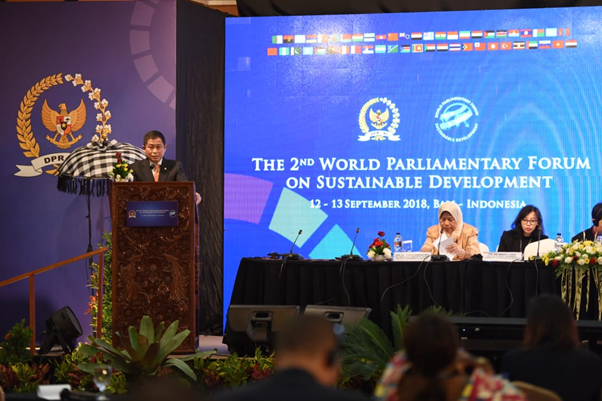 The results of the 21st Conference of the Parties (COP) in 2015 on climate change contained in the Paris Agreement were answered by Indonesia with the implementation of various policies concerning New Renewable Energy (EBT). "Disparities (prices) are still a challenge. For this reason, the Indonesian government and parliament are starting to echo EBT so that energy prices can be affordable (affordable)," explained Minister of Energy and Mineral Resources (ESDM) Ignasius Jonan when he was the main panelist at The 2nd World Parliamentary Forum on Bali, Wednesday (12/9). In front of the delegates, Jonan mentioned the development of installed capacity from EBT plants until mid 2018. 140 Mega Watts (MW) increased from geothermal energy, 94.1 MW from solar, micro hydro and wind and bioenergy contributed 18 MW. "Of course what is important to see is the growth of the power plant and how it supports the Indonesian parliament," he added. In order to optimize the utilization of EBT, Jonan conducted a policy update by targeting the transportation sector through the B20 mandatory program. "The challenge now is not for the generator but for the transportation sector," said Jonan. In fact, Jonan revealed that he was discussing with other state ministers such as Malaysia to assess the significance of the implementation of the policy. Another strategic policy is the installation of solar panels. In fact, the Ministry of Energy and Mineral Resources is preparing a regulation on the use of rooftop solar panels or solar PV roofs in homes and office buildings. "We are now trying to run a 35,000 MW program from Solar PV," he said. The government itself continues to accelerate in achieving the energy mix target by 2023 in accordance with the National Energy Policy (KEN). "Indonesia is still committed to achieving EBT in the energy mix of 23% by 2025," said Jonan. He explained, until August 2018, there were 70 contracts that had signed EBT plants with 4 details already operating, 23 construction stages, and 43 in the financial close preparation process. "All EBT policies are above the form of the Government's responsibility in controlling the energy consumption of the community so as to create sustainable development," Jonan concluded.